Eaton Corporation is a global technology leader in electrical components and systems for power quality, distribution and control; hydraulics components, systems and services for industrial and mobile equipment; aerospace fuel, hydraulics and pneumatic systems for commercial and military use; and truck and automotive drivetrain and powertrain systems. Eaton’s Electrical Sector provides electrical power distribution, power quality systems, industrial automation and control products and services for industrial, utility, commercial, residential and information technology markets. 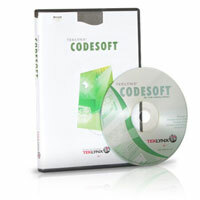 Eaton’s Electrical Sector recently consolidated its worldwide label printing using TEKLYNX® SENTINEL™ to interface with its enterprise systems, and CODESOFT® to manage worldwide formatting and printing. A world renown furniture retailer has chosen the Datalogic Skorpio™ to facilitate the handling & tracing of incoming goods. The investment amounts to several thousands of units in the company’s furniture stores around the world. The Datalogic Skorpio™ was chosen among its competitors to be used in the company’s new logistics system to handle goods flow. This handheld device offers a Windows operating system, simplified numeric keyboard, excellent ergonomics and extreme ruggedness. In addition, the Datalogic Green Spot assures good read feedback, even in noisy environments. This, along with its service program and management software, Wavelink® Avalanche, guarantees an effective, stable, secure and user-friendly solution in hundreds of stores every day. The Datalogic Skorpio™ also offers other advantages. The Ethernet 4-slot cradle is the most compact in its class, allowing the mobile computer to be recharged even in the most crowded areas of the warehouse. Thanks to this accessory, the Datalogic Skorpio™ installed in-field can be remotely managed using the Wavelink® Avalanche™ console. The option of using the handheld terminal or the Gun model is also given. The furniture store can choose between these two options, based on its needs for the various store applications. Not all the sandwiches RH Foster makes and sells at its chain of Exxon-Mobile convenience stores in Maine are triple-deckers, but labeling them for sale was always a laborious three-step process. Once sandwiches were made and wrapped, the store clerk would apply a preprinted label that identified the sandwiches and its ingredients. The clerk would then grab a labeling gun to set and produce the price label. Finally, the clerk would take a separate labeling gun and set the date to make a "use by" freshness label. That’s three separate steps, and the final product wasn’t even bar coded, resulting in an extra manual step to ring up the sandwiches at the point of sale. The process also created support requirements at headquarters, where the sandwiches and other food product labels were printed. The foodservice manager would personally print all the labels and either ship or deliver them to retail locations, and was responsible for ensuring each store had enough of the dozens of different product labels that were used. Stores would sometimes run out of preprinted labels and would have to create handwritten ones until a new supply arrived, or end up throwing away labels when ingredients changed or sandwiches were discontinued. RH Foster wanted to find a smarter way to label its Freshies®- brand products, which are made fresh in each of the company’s 12 retail locations each day. What it found was a smart labeling process that takes advantage of intelligence embedded in an in-store label printer to take time, steps, guesswork and errors out of preparing product labels. RH Foster credits the system for saving at least 130 labor hours per store, per year. The Swedish company Industriverktyg IDG Tools AB sells tools in a somewhat unique way. Driving around with exhibition buses in Sweden, Norway, Finland, Denmark, Poland and Italy, they display their product range and take orders using the Kyman™. The company owns more than 80 buses and have an equal amount of sales people. Their offices and warehouse are situated near the airport in Stockholm, not far from the harbor where they ship their goods to Finland and Poland. Products to their Swedish and Norwegian customers are transported over night, and the orders are delivered to most of the addresses as soon as the day after the order is taken. IDG Tools AB’s product range is made up almost solely of their own well-known trademark, IDG Tools® (Industrial Development Group). The company has an extensive product range, most of which can be found on exhibition buses. IDG Tools uses the mobile computer Kyman™ from Datalogic Mobile in their warehouse and has done so for about a year. The warehouse consists of 4000-4500 items and 6500 places for pallets. Kyman™ is used to make the picking procedure more effective and simpler. Previously, they used a mobile computer of another brand, which they had to replace since it did not meet their needs. The reason they chose Kyman™ was due to a recommendation by Sundit – the supplier of their ERP system. IDG Tools gave a list of requirements to Sundit; their main requirements being flexibility, color screen and reliable on-line communication. Sundit then turned to Datalogic Mobile Partner, for the right product. Datalogic Mobile’s Kyman™ filled these needs. In addition, it is ergonomic, suits the hand, has a sharp screen and is very fast. For all of these reasons, IDG has been very satisfied with their choice. MSC Home Terminal, the largest container terminal in the port of Antwerp, is a 50/50 joint venture between PSA (Port of Singapore Authorities) and MSC (Mediterranean Shipping Company). Located at the Delwaide dock in Antwerp, it is the most important North European hub for MSC. The terminal’s vital statistics are impressive: a total surface area of 1.6 million m², a quay length extending to almost 3 km, and a total capacity of around 4.3 million TEU. It operates 24/7. Not surprisingly, MSC Home Terminal is equipped with state-of-the-art handling equipment and controlled by high-performance IT applications. A wireless network was recently implemented. MSC Home Terminal decided to replace the aging narrow band system with a modern Wi-Fi 2.4 and 5 GHz network. At the same time the technical department wanted to launch a proactive maintenance system which would enable maintenance messages to be monitored and eventually sent to the straddle carriers. The messages would inform the drivers to bring their straddle carrier in for a service check. Various selection criteria were drawn up for the vehicle-mounted computers. At the top of the list was undoubtedly the ruggedness of the devices, closely followed by the readability and ergonomics of the screens. All teams of MSC Home Terminal were involved in the selection process, from management to dock workers. A short list of three suppliers was drawn up and their devices were thoroughly tested by users for ruggedness in a tough industrial environment, ergonomics and screen readability. In addition, the technical department and the IT department looked closely at the technical specifications to ensure the selected device had all the necessary features for end-to-end monitoring of the straddle carriers. 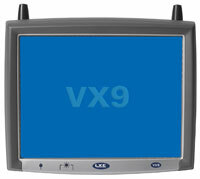 Finally, the decision was made for LXE’s VX9 Förj vehicle-mount computers. These are rugged, Windows XP-based mobile PCs with 12.1” touch screen display. Around 120 LXE VX9 Förj computers will be installed on straddle carriers at MSC Home Terminal. The Förj is implemented as a FAT client allowing it to communicate with an independent PLC and the TOS. New technology changed Wet Seal’s price markdown and receiving processes from a nightmare to a dream. Ron Hunt, Senior Manager of Operations for Wet Seal, a specialty retailer with approximately 400 stores in the United States and Puerto Rico, explained how his company reallocated labor hours being wasted on price markdowns and reduced shrinkage with help from the Datalogic Falcon® 4400 mobile computer. Caritas Home Care has found the formula for improving healthcare quality and cutting costs. By porting its legacy mobile medical software to new handheld computers with enhanced communication and data collection capabilities, the Boston-area home healthcare agency saved its care providers an average of more than a half hour per day, lowered its operating expenses, and positioned itself to deliver more services and improved care. Caritas Home Care has 150 mobile clinicians who provide a variety of medical and social services in the patient’s home, including nursing, post-hospitalization follow ups, physical therapy, counseling, geriatric services, respiratory therapy and more. The agency was one of the first to use mobile medical software to record the care given and take notes during patient visits. As an early adopter, Caritas Home Care learned several hard lessons about the most efficient ways to use mobile computers in healthcare settings, and about the best devices for the job. When the time came for Caritas to refresh its mobile computers, it sought to leverage its investment in legacy software and improve its operations by taking advantage of technology advances that occurred since it first deployed consumer-style PDAs a few years earlier. In recent years Rold Skov Sawmill has grown significantly and extended its wood processing capacity. Although this has led to an increase in revenue, the previous system for tracking inventory and controlling stock could no longer cope, so the IT team began to look for a new solution which could automate the process. The Rold Skov sawmills team chose to use Motorola barcode scanners in conjunction with a Motorola wireless network to record details of the timber stock. The world may know the Royal Canadian Mounted Police (RCMP), or Mounties, by their traditional crimson uniforms, but the RCMP is responsible for much more than maintaining its legendary image. A world-class police force, the RCMP is unique; providing law enforcement services to federal, provincial, and municipal levels of government. In the aftermath of 9/11, the RCMP decided to expedite the modernization of the information system infrastructure for its forensic laboratories, and Zebra thermal printers were an integral part of the solution. The RCMP operates a Forensic Laboratory Service with six forensic sites across Canada, which used a homegrown case tracking system supported by Microsoft Foxpro databases. At that time, the laboratories operated somewhat independently and access to important case files was limited by location. The processing of crime scene evidence was sometimes slowed if the evidence reports and the experts who needed to review them were separated by geography. The system worked, but the RCMP wanted greater efficiency. The RCMP sought a Zebra Technologies partner, to provide a complete laboratory information management system (LIMS). They offered LIMS-plus, an off-the-shelf software application that mirrors best practices from forensic labs across North America. The RCMP wished to improve productivity, internal and external communications, reduce costs, leverage scientific talent across the country, enhance security, and introduce consistent scientific methodologies. “The second consideration was track record. I had to be certain that other forensic facilities in North America were using the system for interoperability purposes, and that the supplier had a good track record and reputation. ” said Mr. Buckle. Bar code technology was the right answer for Hilti due to the sheer volume of service repairs the company completes annually. Hilti performs about 30,000 services/repairs per year and the entire repair process from receipt of complaint to customer delivery generally takes only three days. Therefore, it was critical for Hilti to utilize a bar code system that was capable of handling their fast pace and improve their processes.